This is a normal fetal ultrasound performed at 19 weeks gestation. Many health care providers like to have fetal measurements to verify the size of the fetus and to look for any abnormalities. 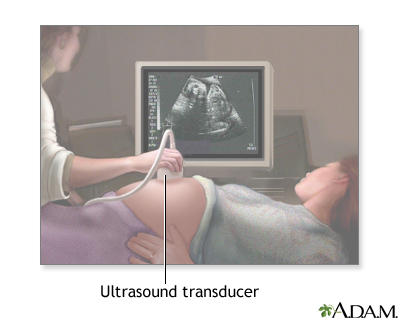 This ultrasound is of an abdominal measurement. It shows a cross-section of the abdomen, and the measurements are indicated by the cross hairs and dotted lines. This is a normal fetal ultrasound performed at 17 weeks gestation. This is the type of image pregnant mothers may see on the ultrasound screen, or that the technician may print. It shows the head on the right, and the cross hair pointing to the left ankle. The left leg and arm are visible in the center of the screen. This is a normal ultrasound of the fetus performed at 19 weeks gestation. A clear view of the left femur (the large bone of the leg) can be seen in the middle, towards the top of the ultrasound screen. 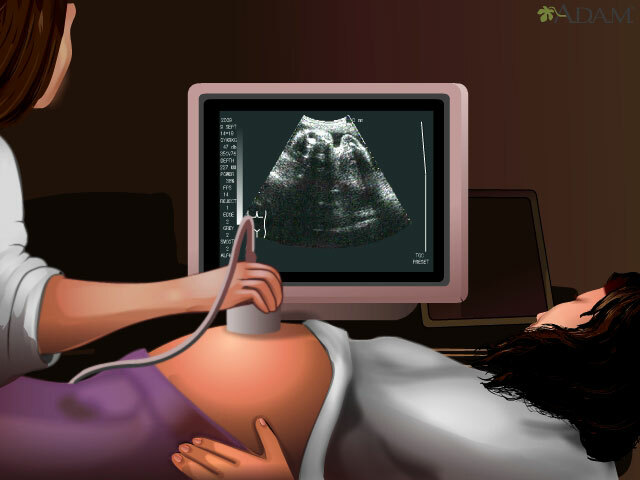 This is a normal fetal ultrasound performed at 19 weeks gestation. Many health care providers like to have fetal measurements to verify the size of the fetus and to look for any abnormalities. This ultrasound is of a head measurement, indicated by the cross hairs and dotted lines. This is a normal fetal ultrasound performed at 19 weeks gestation. This is the type of spilt-screen display you might see during an ultrasound, or if the technician prints a copy of the ultrasound for you. 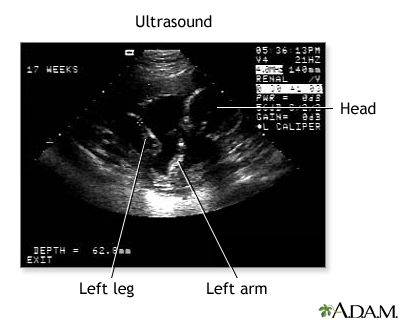 This ultrasound shows both the left arm (seen in the left side of the display), and the lower extremities (seen in the right side of the display). The white areas of the arm or legs is developing bone. This is a normal fetal ultrasound performed at 19 weeks gestation. This ultrasound shows two interesting features. In the foreground, to the left and middle of the screen, you can see the placenta, following the curve of the uterus. In the background on the right, where the cross hair is pointing, you can see the face with all the facial features visible.